Marriages may be made in heaven but they are certainly made lavish, warm, delightful and fabulous here on earth. This special day requires special care and a special venue. 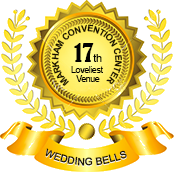 Here at Markham Banquet & Convention Centre we ensure to make your day more special and completely unforgettable. At Markham Convention Centre, we want your wedding reception party to be a spectacular one, and we will ensure that your guests receive a superior level of service, and enjoy food that is prepared to delight them not just visually but gastronomically as well. We pay attention to all the details, even the trivial ones because we know that it is often the small details that make a huge difference. We make sure that we provide captivating wedding decorations at our varied wedding reception venues in Scarborough, Ontario. Whether you’re planning an intimate evening wedding or a day-long celebration on a grand scale, we will work with you to tailor each detail to your vision. From your initial inquiry to your last dance, our elegant space, menus and services will ensure your event is truly memorable. We take pride in ensuring that you enjoy your big day without any insecurity about the wedding celebration arrangements by catering to your every possible need. As we understand the importance of this special day in your life, we strive to not only please but pamper you too. Customer satisfaction remains our main aim. Our wedding specialists with their unique wedding ideas are always ready to cater to your needs. Simply fill out the appointment form on the right to chart out your dream wedding! ©2017 Markham Convention Centre. All rights reserved.